As a contemporary and chamber music enthusiast, Hainen has launched major commissioning projects, including works by Pulitzer Prize winners Bernard Rands and Melinda Wagner, the latter being a world premiere of Pan Journal with the Juilliard String Quartet for the Philadelphia Chamber Music Society. This season Hainen will treat audiences to the premiere of a new concerto commissioned for her by The Philadelphia Orchestra, written for her by acclaimed Beijing Olympics composer Tan Dun. The collaboration between composer and artist will prove to be a groundbreaking work for the harp community and classical fans. Hainen has performed at the festivals of Cartagena, Grand Tetons, Kingston, Marlboro, Sachsisch Bohmisches, and at the World Harp Congress; she has appeared on concert series by Lyon & Healy, the Korean Embassy in Costa Rica, the French Embassy in Washington D.C., the Cleveland Museum of Art, and the Saratoga Chamber Music Festival, among others. 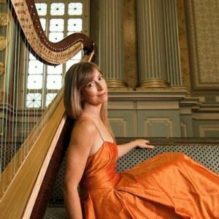 A highly sought after harp pedagogue, Hainen serves on the faculties of the world-renowned Curtis Institute of Music and Temple University and has been invited to adjudicate major international harp competitions in the U.S. and in Europe. In 2004 she founded the Saratoga Harp Colony, in Saratoga N.Y., which welcomes approximately 20 of the most promising young harpists for two weeks of intensive study each summer. Through her nonprofit foundation The Lyra Society, Hainen has provided educational outreach to hundreds of school children in urban Philadelphia and the surrounding area. Born in Toledo, Ohio, Elizabeth Hainen began the harp at age ten. Her extraordinary progress took her to her mentor and teacher, Susann McDonald, at Indiana University School of Music where she was awarded the “Performance Certificate,” and two degrees in performance. Ms. Hainen has been the recipient of numerous awards, including Winner of the American String Teachers Association and the Chicago Symphony Civic Orchestra Competitions, and Silver Medalist at the First USA International Harp Competition.